Mabef table top sketchbox easel from Starvin' Artist Chicago. 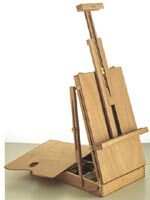 The Mabef table top sketchbox easel is made of oiled beechwood with brass hardware, this easel is of the highest quality construction. It features a tin-lined storage drawer with four paint and brush compartments and a wooden palette that acts as a cover when the easel is transported. It accommodates canvases up to 34" and weighs 6-1/2 lbs.